After battling with the unpronounceable names that the International Nomenclature of Cosmetic Ingredients (or INCI) choses for their chemicals, I found that my pack conditioner had many more emulsifying chemicals than a regular conditioner. An emulsifier is a type of surfactant, its molecules encourage the stable mixing of two liquids that wouldn’t normally mix. Mayonnaise, for example, is an emulsion of oil and water (egg yolk is 50% water), and lecithin is a fatty component found in egg yolk that acts as the emulsifier. The more emulsifiers you add to a conditioner the more strongly they bind to keratin (the protein that makes up hair). The emulsifying molecules that don’t come off after rinsing cover the hair surface and make it look healthier and less dry. While I was knee-deep researching emulsions, Wikipedia pointed me to the Tyndall effect, which explains why shorter-wavelength light is more prone to scattering by small particles than longer-wavelength light; and by extension, why blue eyes don’t actually have any blue pigment. 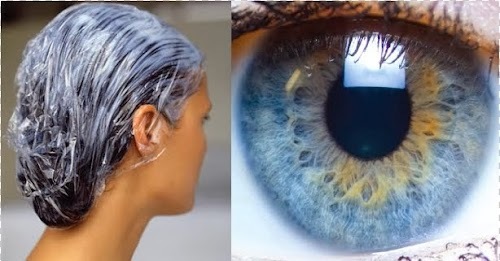 Human irises without melanin are translucent—in effect, an “emulsion” between a translucent layer and embedded small particles that make it look turbid. When light particles enter the turbid layer, those that have longer wavelengths (which we perceive as red) get through, and the ones with shorter wavelength (which we perceive as blue) get back-scattered by the small particles embedded in the iris. We know that wavelength affects electromagnetic radiation from our everyday experience: radio waves (longer wavelengths) can traverse walls so you can hear NPR, while visible light waves (shorter wavelengths) can be conveniently reflected by simply closing the bathroom door. This translucent cryolite glass looks the way an iris does: it shows a different hue depending on the color of the background. From this observation we can infer that implanting a light bulb in the back of the eye (so it wouldn’t look dark), would make “blue” irises look yellow. Here are some other wonders caused by the Tyndall effect, including why the sky is blue. I love random science walks.